Animal Wildlife | Antelope | The antelope is a deer-like mammal found in Africa, Asia and parts of the Americas. 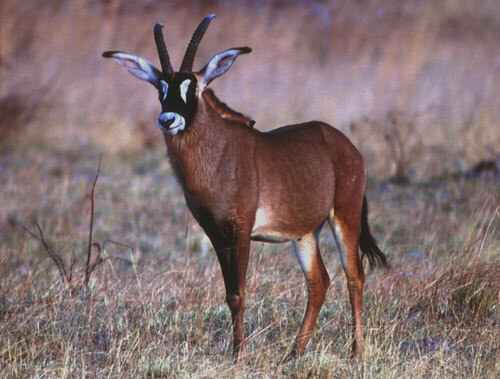 There are many different species of antelope including the tiny Royal antelope that stands at the height of a rabbit! 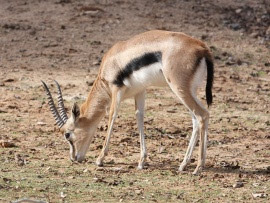 Unlike deer that renew their horns annually, the antelope has strong permanent horns, that antelope mainly use to defend their herd or to fight other antelopes. An antelope tends to get to between 8 and 10 years old in the wild although they have been known to live for longer when kept in captivity. Many antelope individuals however, wouldn't last into old age in the wild as antelope are a key target for many large carnivorous mammals. If the antelope was old then the antelope would naturally be slower at running from danger. The antelope is one of the many medium-sized mammals holding the African food chain together. 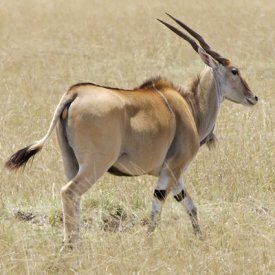 The antelope may only graze on grasses but it is a stable food source for many of Africa\s large carnivorous predators, such as lions, hyenas and crocodiles. Antelope display different defensive behaviours based on their size, habitat, number and species. The smaller solitary antelope tend to live in dense forested areas and these species of antelope defend themselves by hiding. The duiker antelopes get their name from this specie\'s ability to dive into the vegetation. 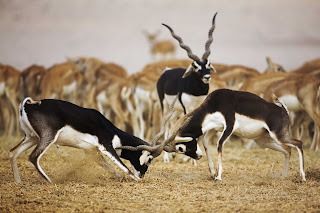 Gazelle-sized antelope run and leap, and some species of antelope exhibit their unique behaviour of pronking or stotting. Large antelope congregate in larger herds and can depend on running as group defence. The antelope is found in a wide range of habitats, typically woodland, forest, savannah, grassland plains, and marshes. 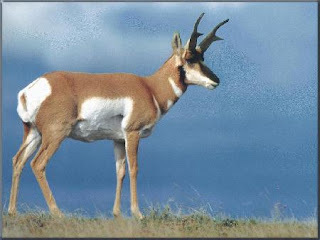 Several species of antelope have adapted to living in the mountains and rocky outcrops, a few species of antelope have adapted to deserts (both hot and cold), and a couple of species of antelope are even semi-aquatic and these antelope live in swamps. After mating, female antelopes give birth to a single calf or, more rarely, twins, after a gestation period that can last up to eight months. A mother and her newborn calf are vulnerable to predators, and antelopes have had to evolve different strategies for surviving this period. For most antelope species, the female gives birth in dense cover and leaves the calf while she feeds. The calf comes to its mother when she calls it, and once fed, the calf will hide away again. Once in its hiding place, the calf remains completely still and will run away only if it is on the verge of being discovered.